описание (rus) Awesome Miner программа для управления и мониторинга добычи Биткоин, Лайткоин, ethereum и т.п. криптовалют. Централизованное управление до 5000 miners. Awesome Miner Next generation profitability switching uses both real-time multi-pool statistics and coin statistics to automatically switch between multiple pools, algorithms and mining software to always ensure highest possible profitability. Awesome Miner can also display information, exchange rates and do profitability calculations for Bitcoin, Litecoin and all other popular coins. 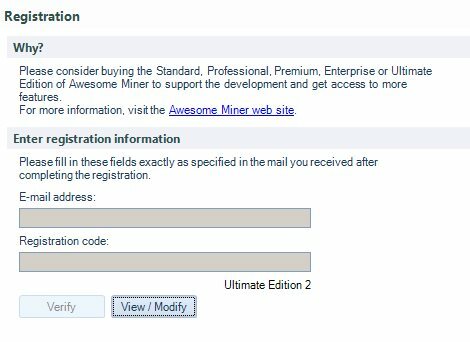 Awesome Miner Ultimate Plus license can show Desktop Notifications on the Windows desktop and send e-mail messages to alert about mining issues. With a Cloud Services subscription, the notifications can also be delivered via SMS or via the Telegram app. Detection of failing devices, high temperatures, slow mining progress, hanging miners and disconnected miners. Automatic restart miners with problems, with fully customizable triggers and actions. Awesome Miner Plus license is a Windows application, but also offers a built-in web frontend that can be accessed from any computer, tablet or smart phone. The web interface gives an overview of all miners, detailed information about selected miners and provides operations for starting and stopping the miners. The optional Cloud Services subscription provides access the same web interface hosted in the cloud, giving access to monitoring and management operations from any device. ver. 6.1.11 Ultimate Plus 5000 от 04.02.2019, полный комплект (+ Remote Agent). • Added context menu (right click) to coins on the Coins tab. Includes direct links to the calculator on the statistics providers web site. • For coins provided by CoinToMine, the context menu include links to information sources about the coin like the web site, Twitter, Bitcoin Talk and Discord where available. ver. 6.2.1 Ultimate Plus 5000 от 21.02.2019, полный комплект (+ Remote Agent). ver. 6.2.8 Ultimate Plus 5000 от 18.03.2019, полный комплект (+ Remote Agent). • Correction to the coin display when the pool URL is identical for two Managed Miners, but the coin is different. Подскажите уведомления через телеграм работают в взломанной версии, или возможно через почту? при активации его необходимо указать email и registration code - в разделе Option -registration соответственно пусто. Пробовал кто то что то вписывать туда? тестировали ли ? работают ли удаленно уведомления каким либо образом почта телега?